Everybody seems to be stoked because of Wonder Woman, which hit theaters last week. With the gorgeous Gal Gadot as the lead actress, we’re not really surprised the movie has gotten such massive support. Both critics and regular moviegoers we’re also united in saying that the film was a massive success. Heck, even the ladies of FHM weren’t immune to Gal’s charms and immediately named her as their new girl-crush! If for some reason you still don’t get her alluring appeal, here are various reactions from our very own ladies, who all seem to have fallen for the heroine that is Wonder Woman. 1) May cover girl Kris Bernal is clearly getting some serious workout motivation from Diana Prince. 2) Even Angel Locsin couldn’t help but be a giddy fangirl while raving over Bubble Paraiso’s perfect Wonder Woman cosplay. 3) Marian Rivera, meanwhile, just had to post a throwback photo of herself channeling her inner power, grace, wisdom and wonder. 4) Look who’s watched the movie: none other than FHM Sexiest Woman Jessy Mendiola. Jessy has also been a long time Wonder Woman fan way before all the hype from the movies came about. 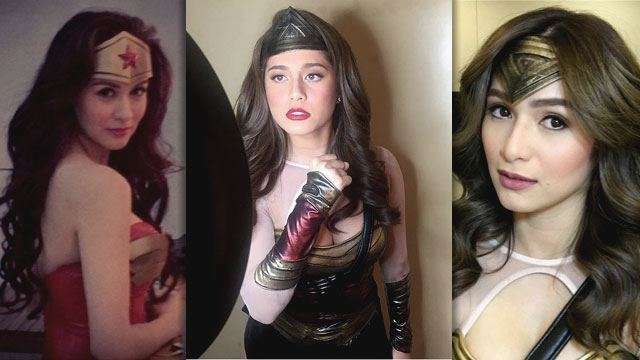 5) And of course, who could forget Jennylyn Mercado’s on point portrayal of Wonder Woman last year? Damn, we could easily mistake her for Gal.